The first time I made these tacos, I got the idea from a friend that was trying to come up with a recipe himself for Tacos Al Pastor for the restaurant where he works. He is mexican and uses an authentic method. I was looking for something simpler. I wanted an easy pork tacos recipe for my son’s birthday party. I needed something simple because I was cooking all the food by myself and I already had so much going on. I had a salad bar with homemade croutons and dressings (of course, 4 different types of dressings). I had a taco bar, with three different types of taco meats and all the fixings, beans, salsas and sauces. (I also love mango tacos.) I also had a hot bar with homemade croissants, eggplant lasagna, homemade mini pizzas and mini tartlets, prosciutto and asparagus appetizers with homemade puff pastry (yes, you get it, I like to make things from scratch). Plus the dessert bar, brazilian fudge balls (brigadeiros) in 4 different flavors, mini key lime pies, pecan pies, strawberry and custard filled cupcakes and of course, the cake! So you get the point, I was swamped with a lot of cooking to do. 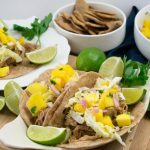 I came up with this slow cooker pork tacos recipe because it’s just so easy to just turn it on and go about your business, come back a few hours later and the food is ready! Plus, the slow cooker is the best for cooking shredded pork, in my humble opinion. I use a few elements of the Tacos Al Pastor recipe here. The pineapple, the orange juice and the chipotle pepper. You start by trimming the excess fat off the pork. 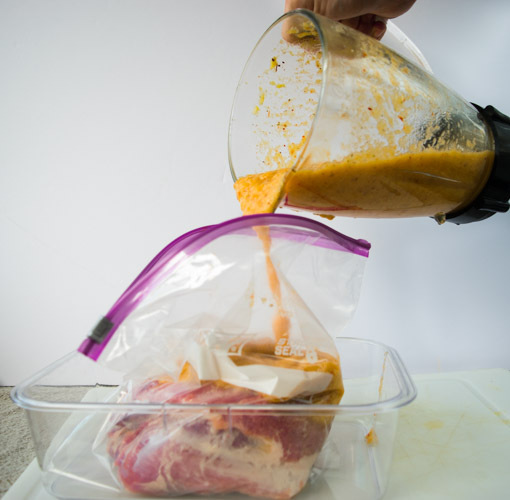 Then blend all the ingredients of the marinade together, and let the pork sit in the fridge marinating for a few hours, to absorb the flavor and tenderize the meat. Throw all of it in the slow cooker and forget about it for a few hours. When you come back, you’ll find a fragrant, moist, delicious pork, falling apart, ready to be shredded. I like to remove the pork, shred it using two forks, then straining the liquid that remained in the slow cooker and cook this liquid until reduced in a small sauce pan for about 10 minutes. Then, I pour about 1/2 cup of it over the shredded pork and it’s taco time! After my son’s party, a few people requested this pork taco recipe. I give them the recipe with one condition, if you make it, invite me! This recipe for pork tacos is one of my most requested ones. Everybody that eats it, loves it! 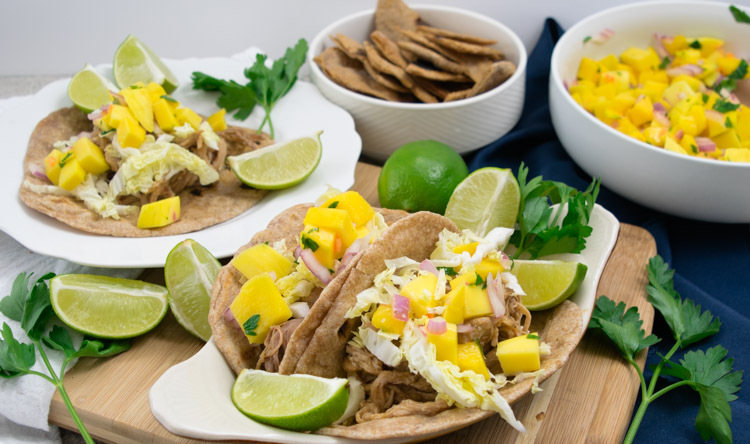 It's easy to make and the pineapple and orange juice in the marinade give the pork an incomparable flavor. 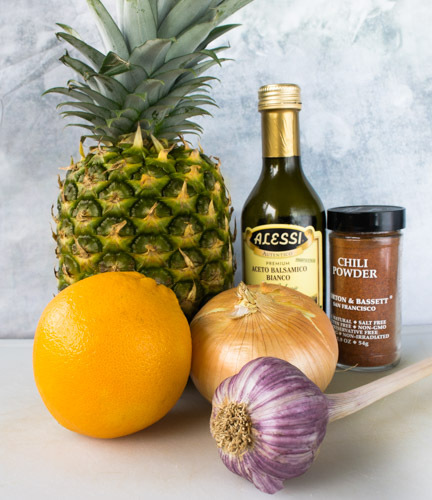 Blend the onion, pineapple, orange juice, vinegar, garlic cloves, salt, thyme, cumin, chile powder and chipotle chile on the food processor. Trim excess fat of the pork. Place pork inside a large resealable bag. Add the marinade and let the pork sit in the fridge, marinating for 4 hours and up to 24. 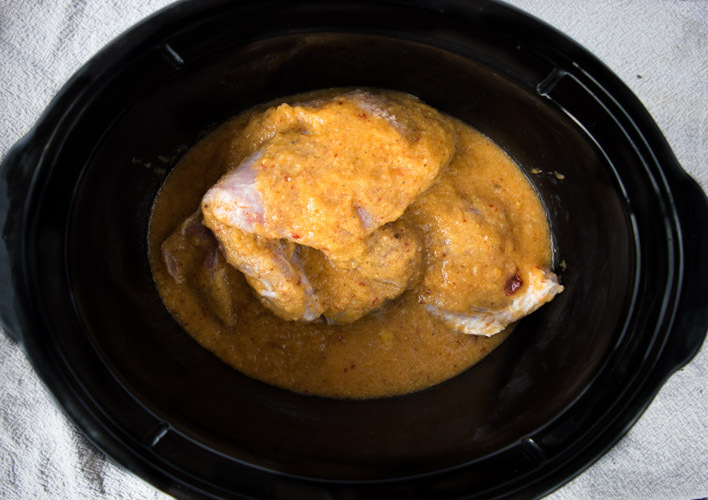 Transfer the pork and marinade to the slow cooker and let it cook for 6 hours on high. 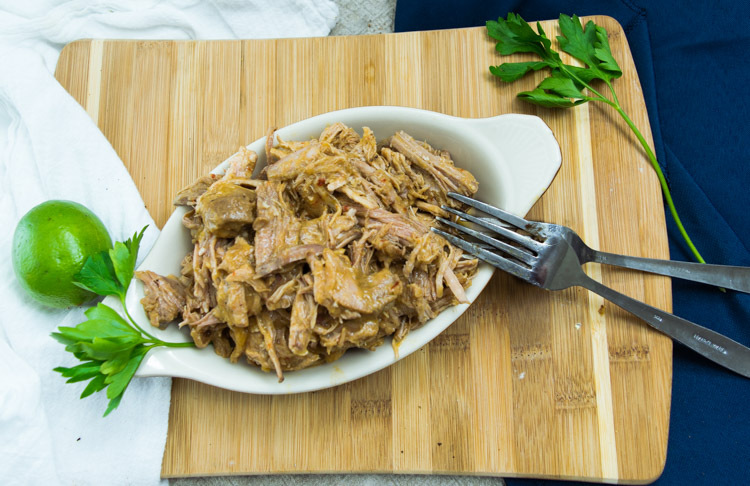 Shred pork using two forks and drain the liquid that remained in the slow cooker. Cook strained liquid in a medium sauce pan over medium heat until reduced, about 10-15 minutes and pour about 1/2 cup of it over shredded pork.